L: 114" x W: 90" x H: 38"
Hunnisett 2-pc. Sectional Sofa Covered in a sleek gray woven upholstery, the Hunnisett 2-piece sectional sofa has an effortless contemporary vibe. The neutral color sets the scene for any type of home decor, and it flawlessly combines comfort with beauty. Covered in a sleek gray woven upholstery, the Hunnisett 2-piece sectional sofa has an effortless contemporary vibe. The neutral color sets the scene for any type of home decor, and it flawlessly combines comfort with beauty. 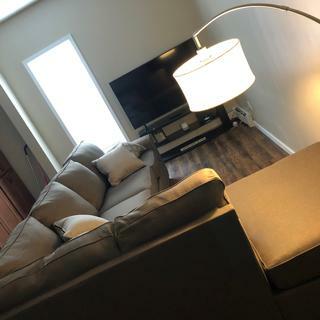 L: 78" x W: 38" x H: 38"
This couch is very comfortable and fits very well in our apartment. The color is amazing and the throw pillows that were included are nice! It is very comfortable. The staff in store and delivering were great. My only issue is that the color in person is a bit different then expected. Love love love my new couch!!! 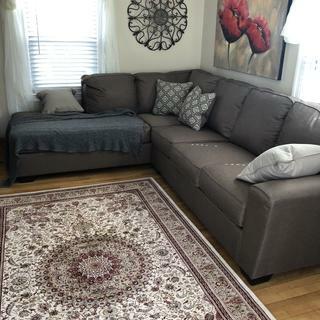 It’s super comfortable and has plenty of room to lounge on! The staff was great, and we were in and out of the store in less than a half hour! This is a firm couch but comfortable. The price is great for the quality of the couch. I don’t use the room that often but took a chance ordering online without trying it out. Not disappointed. Love it. Color is universal, complements a whole range of colors. Very comfortable! It seems to be wearing quickly with two dogs, but I’m looking into buying a new cover for the chaise. I noticed the sofa didn't have much fibre in the back rest the very day it was delivered but I thought it was just a little hiccup I could overlook. It's getting worse by the day. It's completely sagged and it looked old. Will never recommend this to anyone! Not as comfortable as the showroom model. Not what i expected. I am now 5 days past ownership and cannot return it. Salespeople were great at both Lake Grove locations. Need more time to evaluate the product next time around. Fast delivery! I ordered this online Saturday afternoon and my couch arrived around 10:30am on Monday! I’m impressed with this sectional. Glad I came into the store because online this was not my first choice but I fell in love when I saw it in person. Great color and it compliments my living room well. I LOVE THE COUCH. Its a tiny bigger than the wall its up against, but not an issue. The cushions are firm but not a rock. The delivery guys were great. VERY HAPPY. 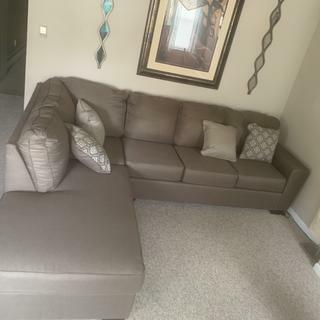 Love the couch but loved the service we got at the store even more! But be aware: you could just call asleep on it without knowing. The delivery was faster and the service at the store in South Plainfield was Amazing!!! Love love love!!! Separates our living room from our kitchen just perfect!! Super happy with our choice and satisfied with how comfy it is as well!! At first I was going to change it and get something else, but after given it some thought, I decided to keep it and I’m so glad that I did. The sofa was delivered 2 days after purchase. The delivery was early in the morning so we didn’t lose the whole day waiting. It fits perfectly in our family room. We just love it! Wish the delivery was free, would have made it that much better. We also had to pay someone to take away our old furniture. Perfect for a small space and very comfortable. Delivery was on time. Beautiful!! Looks way better in real life than in these pics. Go see it in the show room because this is a must have and a STEAL! Wonderful 2 pc. Color is not too dark or light. Strong material on thr fabric. Family of 7 and we all can watch tv together! Just a bit heavy to move when cleaning around. Hi Kristen, we apologize that the sofa was not delivered in perfect condition! If you could, please email us at rfcare@raymourflanigan.com with your order detail, contact information and a copy of your concerns, we will forward this to the correct leadership group. Is this color more of a gray or beige? BEST ANSWER: The Hunnisett is Cashmere, which is more of a gray. BEST ANSWER: The seat cushions are loose. The back cushions are attached. What size door way will this fit through with the feet detached? BEST ANSWER: The recommended door width is 32" easily with the feet removed. Is the ottoman still available to match the Hunnisett sectional? BEST ANSWER: The ottoman is not available for purchase. How deep is the seat? BEST ANSWER: For the Left-Arm-Facing Corner Chaise, the seat depth is 72". For the Right-Arm Facing Sofa, the seat depth is 21". BEST ANSWER: Back cushions are attached to the sofa and not removable. Bottom cushions are attached with Velcro and covered with a cheaper black fabric. I did find I could take the cover off and flip the cushion before putting the cushion cover back on, to change the wear to the other side of the cushion. This a beautiful set that is durable. It withstands all of the visitors who prefer to sleep on it instead of staying in the guest room. 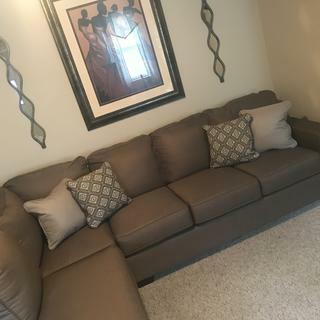 However, the cushions are NOT reversible because each cushion has Velcro strips on the bottom to keep them attached in place on the base of the couch. Is the loveseat for this style also available? BEST ANSWER: The Hunnisett collection is only available as a 2-piece sectional, including a chaise and sofa. Can the chaise be switched to the opposite side ? 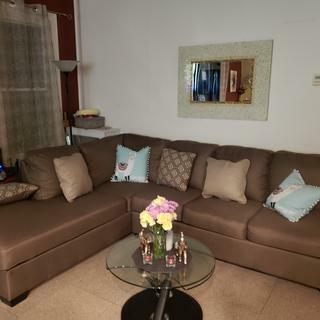 BEST ANSWER: Hi Shon, thank you for your interest in the Hunnisett sectional sofa. You cannot switch the chaise to the opposite side. However if you need the chaise opposite of the configuration it is shown in you can order it that way. I have attached the product in that configuration. No, but it’s perfect otherwise. I love my sofa! 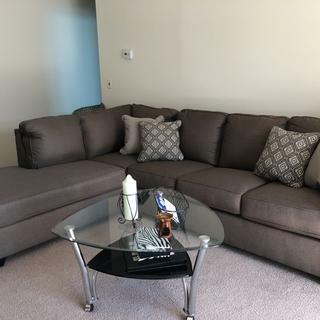 I already have this sofa and need one more single seat for the same piece.Is it possible to get? If yes, then what will be the cost? BEST ANSWER: Hello Neha, the Hunnisett sectional does not offer an armless chair piece. I only received 3 pillows, two plain and one print. Is it possible to get the 4th pillow? BEST ANSWER: Hi Sandra! Please contact our customer care department for assistance, 866.383.4484, option 2. They would happy to assist you! What is the maximum weight capacity on this? BEST ANSWER: Ashley Furniture does not provide weight capacities. We recommend no more than 250 lbs. per seat as a general weight guideline. Can I get this in a darker color? BEST ANSWER: The Hunnisett collection is only offered in the fabric color, Cashmere, as shown. BEST ANSWER: The seat height is 20"